Mothers Day is right around the corner and you know we’ve always got your back, right? 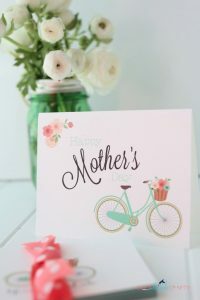 After checking out my archives recently, I realized that I have really failed miserably in the Mother’s Day projects and prints department and I really think that could be a travesty for this little ol’ blog of mine. 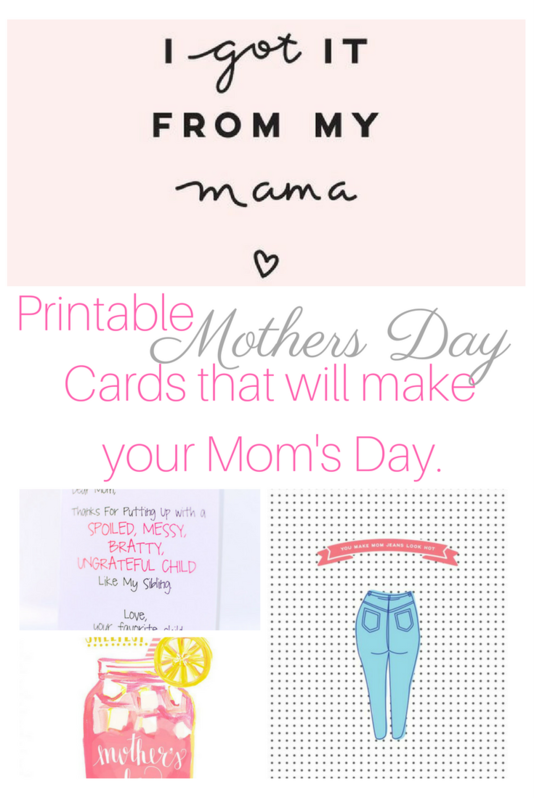 That’s why today we are hooking you up with a bunch of FREE printable Mother’s Day cards. Show mom how much you care with a little help from the blogosphere. And no, these aren’t your average, ordinary, run-of-the-mill Mother’s Day cards either. Where did we find all these great free printable cards? Style Statement– Just leaving this one here… I am quite sure your reaction was similar to mine. You may need a cloth to wipe the coffee off the screen. 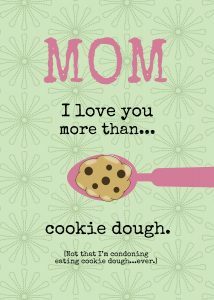 Cookie Dough This funny, and very honest Customizable DIY Printable Mother’s Day Card, so if cookie dough is not your thing (which boggles my mind) you can adjust it! 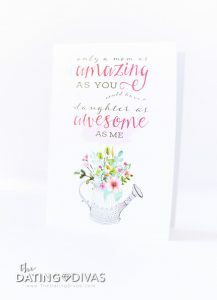 I got it from my mama– Sam, a graphic designer who blogs at Chasing Gold, created this card for her mom and (lucky for us!) decided to share it with the world. Not feeling the pink? It’s also available in white. 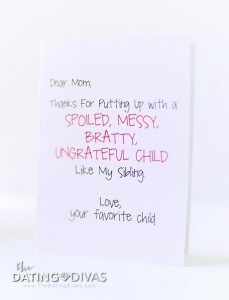 Spoiled, Messy Bratty I wonder, do you think I can get this one printed and in the mail before my baby sister has a chance to give Mom this exact card? I don’t know but you know I am going to try! Lemon aide When life gave you lemons, mom made lemonade. Show your appreciation with this download from Evelyn Henson. 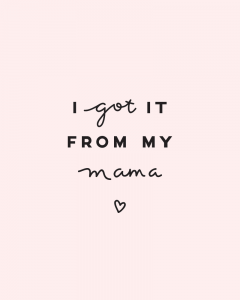 Humble brag If you owe your success to the way mom raised you, this is the card for her. Get the printable at The Dating Divas. Just print, cut, fold and write a heartfelt message! Which one is your favourite?! Let us know in the comments below. *TIP: We recommend printing these on quality cardstock and using a great paper cutter to get nice straight lines! « Once upon a time in Vancouver. Oh these cards are just plain awesome! Thanks for rounding them up for Mother’s Day! Aww, I love these. 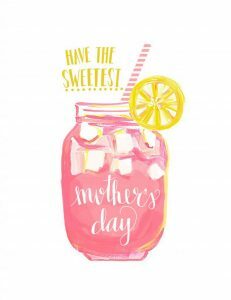 I wish Mothers Day in the UK hadn’t already passed 🙁 Bookmarking for next year! These cards are adorable! Thank you for sharing. Now I have Mother’s Day covered! I love them all. My favorite one is the one with the anchor. How special. Oh these are all so pretty! Thank you so much!!! I am going to print some of these off!!! 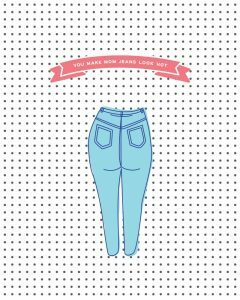 Hahah I seriously love the mom jeans one!! Thanks for the cute printables. Those are darling! Mother’s Day is right around the corner, and I must admit I have done nothing to prepare. These are some really pretty designs! I like the lemonade one a lot! It reminds me of summers when I was little. These are really cute! 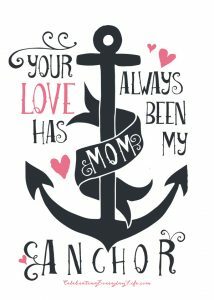 I like the anchor one the best, I would print that for my grandmother if she was still here.